It’s been yet another up-and-down week in the Atlantic 10. La Salle, UMass and Fordham all kicked off the week with some pretty bad loses. 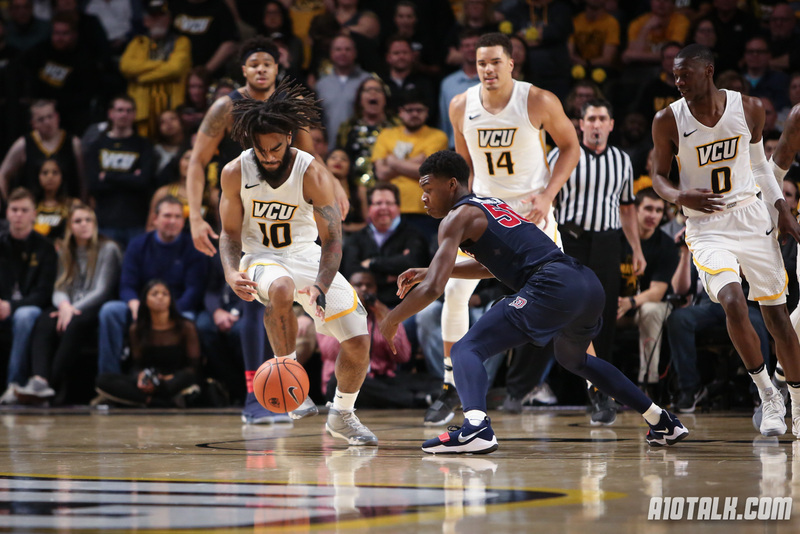 On Tuesday, Dayton and Davidson took home a pair of blowout wins, and Wednesday was highlighted by VCU‘s win on the road at Texas, while the conference as a whole went 5-1. True, Saint Louis‘ loss at Southern Illinois was uninspiring, but overall, a decent showing all around. After dropping four out of five games, the Hawks got back on track Wednesday night with a solid 92-82 victory over Princeton. They will now face their toughest test of the season when they travel across Philly to face Big Five foe, #23 Villanova. The Wildcats enter 7-2, ranked KenPom #18 and #23 in the NET Rankings. That said, La Salle nearly took them to the wire last weekend in what would’ve been one of the most shocking results of the season. The two blemishes on Villanova’s résumé have come at the hands of Michigan and Furman, which while neither are bad loses, both came at home, and did show some signs of weakness in this Villanova team. Perhaps the most shocking start to the season had been Fordham’s 6-1 record entering Tuesday. Then the Rams dropped a 2OT decision at Maine, a team that had been riding a 15-game losing streak dating back to February. Had Jeff Newbauer’s bunch found a way to win that game, we’d be talking about “is Fordham legit at 7-1,” but that script has quickly shifted away from that mentality. Still, one would certainly hope that the Rams will come out for this game hungry and motivated after a pretty embarrassing loss at Maine. Rutgers themselves has been surprising this season too, coming in at 5-3, and ranked KenPom #99, including a win at Miami. This could be a sneaky good game for your Saturday afternoon. The Flyers have surprised a lot of people so far this season, jumping to a 5-3 record, with a win over Butler, and an overall very strong showing in the Battle 4 Atlantis during Feast Week. If Dayton wants to make a legitimate case for an at-large bit to the NCAA Tournament, a win tonight at Auburn would go a heck of a long way towards that. The Tigers, in addition to being ranked 8th in the AP Poll, are KenPom #8, and #7 in the NET Rankings. This is a team that by every advanced metric, looks like at least a Sweet 16 team this year. Their only loss of the season came in a 6-point loss to then-#1 Duke. The Flyers are going to have their hands full, but if they can somehow manage to pull this off, man would this be one hell of a good win. Buffalo has been a program trending in the right direction for the past several seasons now, and they are finally getting some national recognition for that. The Bulls enter 8-0, one of the last standing undefeated teams in America, with a road wins at West Virginia, and at Southern Illinois and a neutral site win against San Francisco. True, the Bonnies have had a rough start to this season, but getting Courtney Stockard back has helped immensely, as he went for 17 points and 9 rebounds in the Bonnies’ 42-point shellacking of Siena Wednesday night. This has trap game written all over it for Buffalo, and you already know the Riley Center is going to be crazy. This would be a great win for St. Bonaventure if they can pull this out at home. Fresh-off their Wednesday-night upset over Texas in Austin, the Rams will head to Charlottesville to face the #4 Cavaliers. UVA already boasts two wins over A-10 schools this year, trouncing GW 76-57 on November 11, while fending off Dayton in the Battle 4 Atlantis, 66-59. The Flyers are still the team that has played Virginia the closest this season, and you gotta think VCU is feeling very confident after their win at Texas. If the Rams want to be taken seriously in contention for an at-large bid to the NCAA Tournament as well, a win Sunday would go a heck of a long way as well. It’s difficult to know what to make of Saint Louis right now. True, they are 6-2, and their résumé includes wins at Seton Hall, and home against Butler. Their only two loses are against Pitt, who is turning some heads in their own right, and Wednesday night at Southern Illinois. This was by no means a bad loss for the Billikens, based on KenPom and NET metrics, but it was how SLU lost that night was the concerning part. Regardless, Travis Ford and company have an opportunity to get right back on the horse again, against a sneaky-good Oregon State team at home. The upcoming week is a quiet one across the Atlantic 10, as most schools are in finals week. On Tuesday, Fordham will play host to NJIT in what should be a good game. On Wednesday, UMass will travel to Philadelphia to become the 4th of five A-10 teams to face Temple this season. On Thursday, Duquesne will face UMES, while GW closes out the week with what could be a winable game against Howard on Friday night.